This demonstrates how an encoding model can be fit with multiple continuous inputs. 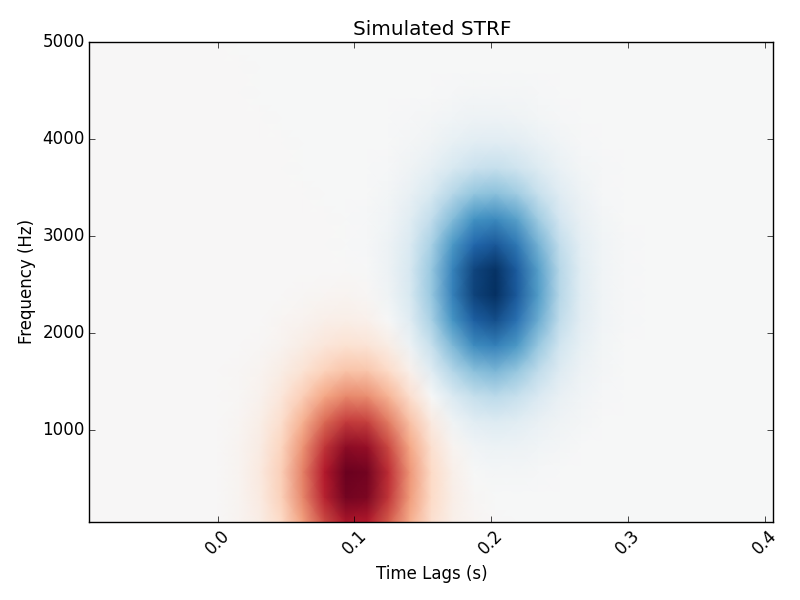 In this case, we simulate the model behind a spectro-temporal receptive field (or STRF). First, we create a linear filter that maps patterns in spectro-temporal space onto an output, representing neural activity. 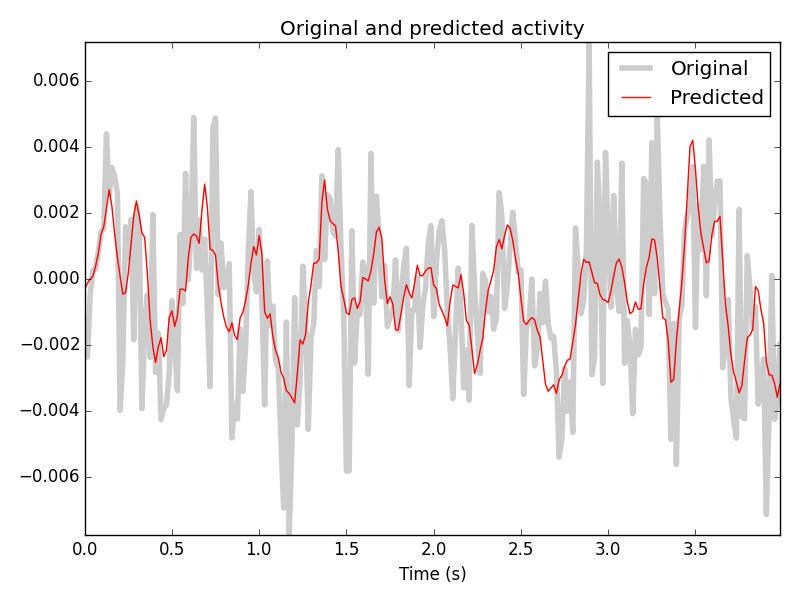 We fit a receptive field model that attempts to recover the original linear filter that was used to create this data. Theunissen, F. E. et al. Estimating spatio-temporal receptive fields of auditory and visual neurons from their responses to natural stimuli. Network 12, 289-316 (2001). Willmore, B. & Smyth, D. Methods for first-order kernel estimation: simple-cell receptive fields from responses to natural scenes. Network 14, 553-77 (2003). We’ll read in the audio data from  in order to simulate a response. In addition, we’ll downsample the data along the time dimension in order to speed up computation. Note that depending on the input values, this may not be desired. For example if your input stimulus varies more quickly than 1/2 the sampling rate to which we are downsampling. # Read in audio that's been recorded in epochs. We’ll simulate a linear receptive field for a theoretical neural signal. This defines how the signal will respond to power in this receptive field space. 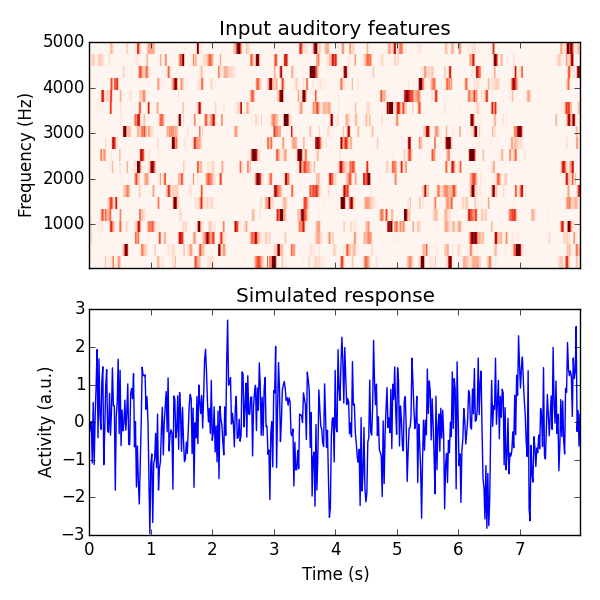 Using this receptive field, we’ll create an artificial neural response to a stimulus. To do this, we’ll create a time-delayed version of the receptive field, and then calculate the dot product between this and the stimulus. Note that this is effectively doing a convolution between the stimulus and the receptive field. See here for more information. # Reshape audio to split into epochs, then make epochs the first dimension. Finally, we’ll use the mne.decoding.ReceptiveField class to recover the linear receptive field of this signal. Note that properties of the receptive field (e.g. smoothness) will depend on the autocorrelation in the inputs and outputs. # Now make predictions about the model output, given input stimuli. # Plot the original STRF, and the one that we recovered with modeling. Above we fit a mne.decoding.ReceptiveField model for one of many values for the ridge regularization parameter. Here we will plot the model score as well as the model coefficients for each value, in order to visualize how coefficients change with different levels of regularization. These issues as well as the STRF pipeline are described in detail in , , and . Tikhonov [identity] regularization (Equation 5) reduces overfitting by smoothing the TRF estimate in a way that is insensitive to the amplitude of the signal of interest. However, the Laplacian approach (Equation 6) reduces off-sample error whilst preserving signal amplitude (Lalor et al., 2006). As a result, this approach usually leads to an improved estimate of the system’s response (as indexed by MSE) compared to Tikhonov regularization. 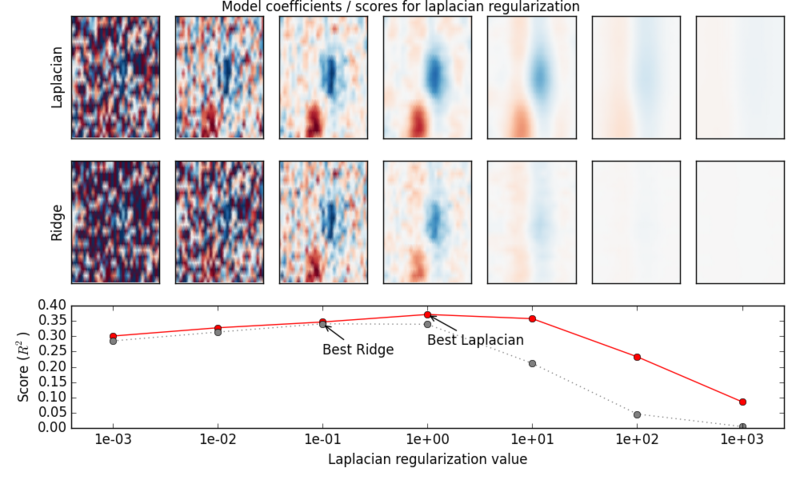 Below we visualize the model performance of each regularization method (ridge vs. Laplacian) for different levels of alpha. As you can see, the Laplacian method performs better in general, because it imposes a smoothness constraint along the time and feature dimensions of the coefficients. This matches the “true” receptive field structure and results in a better model fit. 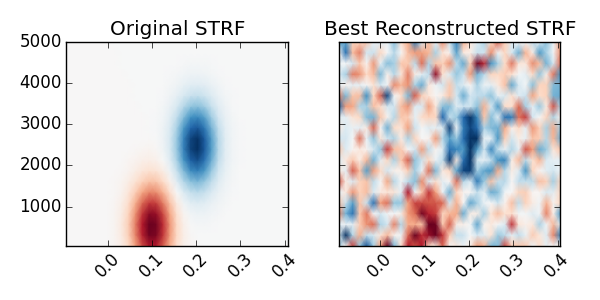 Plot the original STRF, and the one that we recovered with modeling.